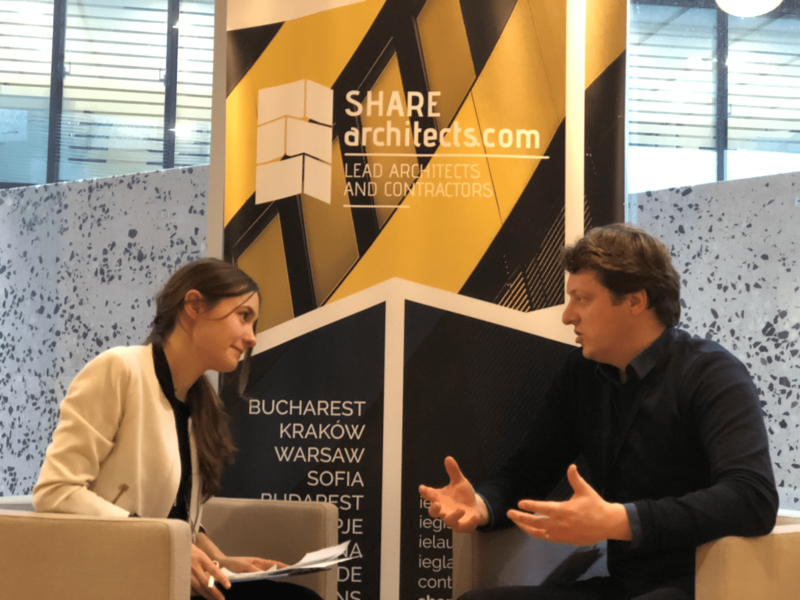 Andreea Movila: We are talking with XANDER VERMEULEN WINDSANT, winner of Mies van der Rohe 2017 Award and a special guest of SHARE conferences. He agreed on contributing to a project we are developing entitled ,,Designing the profile of the future architect” which will collect opinions on this topic from all SHARE speakers for the 10 locations where we organise conferences. All contributions will be published in a volume at the end of this year as a synthesis of the discussions on this topic. His opinion on the subject will be found in the book, therefore, for the moment I invite you to give us a introduction on your working background and your design philosophy. Xander Vermeulen Windsant: I started my office in 2010 because around me I saw that some things were really changing in the way the profession was developing, especially in Holland – it was a very specific context. So it felt quite natural within this changing context, to start my own office, without actually having a concrete project at hand. Business wise it was a bit of a jump into the dark. In the beginning I had a couple of really small private commissions, but off course this was not enough to support an office, so I became somewhat of a project developer myself: I started to initiate projects when there were no projects coming to me ‘automatically’ and this is the way my office could really start. A.M: In this respect, do you believe that young architects, at the beginning of their career who have no commissions could start with identifying an issue in the society, providing an answer and finding a way to people to “build” their visions. ? X.V.W: Yes, the interesting thing is that for people (other than architects) is very difficult to imagine a place or a space in the city in a different way than it is at the moment. We, as architects, we can see alternate realities in every place. And to make this a reality, you don’t have to make a complete plan, you have to plant the idea into somebody else’s head that this place could be something completely different. Only one simple sketch can be enough to start the ball rolling, and when that happens, it is a question of keeping the ball rolling and keeping the momentum. Our imagination can generate very much with only a little – but strategically sensitive – work, it can generate an opening from which new things can start to emerge. X.V.W: Yeah, you also have to be – realistic, connected to economic and political realities, and in a another sense also modest. A project is never about architecture, architecture for me is a tool to achieve something. Through your work as an architect you can contribute to a social interest, a commercial interest, a public interest (or in an ideal situation: all at the same time). I think you should always try to (especially if you initiate a project) to bring all these interests into the project and if you organize this in a good way, the project can become something in which architecture can emerge. If you go to a client, or somebody you want to collaborate with in a project, with the idea that you are going to make architecture, and that’s the only thing, it’s empty. A.M: Could this be the reason why architecture it’s so hard to be defined, that it is embodied in so many fields of activity? What is your definition of architecture? X.V.W: I do not have a definition, I only know that when I see it, I know it’s there..
X.V.W: Yes, something like that. I mean you don’t need architects to make buildings. A physical structure could be built by anybody who can pour concrete at put one brick on top of another brick. Architecture is something when everything perfectly aligns and then there’s something more emerging for all the different layers and constitutive parts. For me, architecture doesn’t exist on paper, architecture is something very vague to put in to words. It is something that emerges between you as a person and a built structure, from the present day or from a couple of centuries ago. A.M: Could it be defined as a message? X.V.W: Yes, but maybe only a subliminal message. Architecture has often been linked to music, as it is a non-representational form of art. I think that, just as a vibrating string on a violin – which in architecture you could equate with a piece of concrete – the music is not in the vibrating sting, the physical substance, but is actually something that you hear, something immaterial. Architecture is I think similar: it is something that you recognize in the perception between the piece of concrete and yourself. X.V.W: Yeah, a building can be just sound, noise, whatever… Architecture should be better than that. In experiencing architecture, there’s something more to experience than just the physical object that is built. As an architect I think you are striving for this ‘something more’. In the end that is also thee difference between an architect and someone who can make a drawing just for building. An architect is able to foresee this extra quality, imagine it and have this constantly in mind in dealing with everything that is happening in a project. In the end I think it’s something magical that from something so mundane as concrete, glass and aluminium, that we can make something actually so incredible as architecture can be. I think this is because we know we have to add something to it which is just beyond the mere physical stuff. A.M: Talking about collaboration, you said that you liked to collaborate with the future inhabitants of the architecture and that it is a key aspect of the development process. So, was this the reason why you were awarded the prize? X.V.W: It is surely a part of it. Kleiburg is the result of the work of a incredible group of people all collaborating on the same goal. For instance, we paid a lot of attention to spatially organizing all the facilities for the inhabitants to be active in the project without losing the architectural integrity of the project. To keep the project simple and affordable, we stepped back from what we are used to do in order to achieve architectural unity: to design everything to the last kitchen, cabinets, nod etc. We found that we don’t have to design these aspects per se: when people can design them for themselves, we only have to design that which is collective, that what they share. For me this is a very interesting issue. In an urban context you need to be a mediator between the city as a public space and place and the private, individual home. There is something in between that. In an apartment building this is not only a façade but also the route you follow from the street to your apartment. This sequence of spaces between the city and what is happening behind the front door of each private apartment is the issue we worked on in Kleiburg. Of course, as an architect I can also contribute to the design of these private spaces, but only if I know this person really, really well, almost intimately. Because only then I really know what he/she really needs to have in his/her private world and can design for that. As in Kleiburg, in most projects we do not know the new inhabitants. A.M: So this was the main challenge of the project, that you didn’t know the final users, so somehow you should have been neutral maybe? X.V.W: I think so… If you make a single, private residence for somebody, this is less of a point. But when you make a building for more than one family than you have this collective thing you have to organize. This collective structure also has to pass the test of time, because in three years someone might move out and somebody else will be coming in. The collective structure will remains, but the individual infill will adjust of time with new inhabitants movin in. This idea of only designing the collective part and leaving the private part open, leaving a lot of possibilities for individual action, without actually designing it is for me the essence of urban architecture. For me it has kind of been a very important point of what urban architecture should be about. It’s a theme which I continue to develop in other projects. A.M: And how did the prize change your life and the way architecture is practiced? X.V.W: The funny thing is that the first half year is was quite chaotic. We never expected we would be the winner, so we had not really prepared for all the attention that followed. A.M: How big is the team you work with? X.V.W. Others might get that idea, but this is of course nonsense. We never worked on Kleiburg with a prize in mind, we just did our work in the way we thought it had to be done. We keep doing that in ongoing and new projects. A.M: How would you describe the state of architecture in your country? X.V.W: In a way, architecture in the Netherlands is famous because of its liberal design attitude. As architects we have a lot of liberty to design the way we want, but, and this is important, this in part possible because we’re not legally responsible for anything. A.M: This including the legislation? X.V.W: Yeah, apart from really stupid mistakes, we are not accountable for problems in construction. .The upside of this is that we can be very free in our thinking, but the downside is that we are very easy to be put aside- we have very little power in the process. Apart from a couple of well known ‘stararchitects’, most Dutch architects find themselves in a very fragile position. And, but this is not something exclusive for the Netherlands, architecture is rapidly reduced to project marketing. The products form our liberal, avant garde-based design tradition, the fancy forms, bold color palettes and extreme structures are nowadays sought after because they offer an interesting commercial distinction – it is a fancy thing. I’m not so optimistic about the state of architecture in Holland, because when we can design anything, doing something crazy becomes the norm. There’s no restriction, there’s no need for an inner logic anymore, we can do anything. I think we will have to find a new inner logic, to put new constraints on ourselves in order to do something meaningful again. A.M: So, this could be a project for the state of architecture in your country- to find a new logic of architecture? X.V.W. : The main issue I think, should be projects, which are not just about building houses but which are about creating special environments, in which social issues, environmental issues, energy issues are integrated into. From this comes a new logic of the project and then we have to think how are we going to build this new environment: public spaces and buildings alike. So we don’t start from the logic of construction, but we start from the logic of an issue we want to solve, and then we’ll try to find the most appropriate way of constructing these solutions. A.M: If a young architect comes to your office, what would be the quality that you would value the most? X.V.W: I think modesty. I get a lot of open applications from people who say they know everything, and they have experience in everything, they are so flexible, so creative etc. Of course you have to show what you know, but I think it’s more important to show that you understand that there is still much more to learn. A.M: This is related to sincerity and being honest with yourself. X.V.W. : Yeah, each time a project has a new logic to it, so of course you can use the experience you have from other projects, but the main thing for me is what is unique to the project, what is different in each project, what is specific in a project. The ability to be open to the specificity of the project is far more important than showing that you can draw a kilometer- high building. I don’t really care about that. If the project is about a garden shed we should put all our energy into creating the perfect garden shed, to be open and flexible in our mind to think about that. A.M: You concluded your contribution to the project ,,Designing the profile of the future architect” saying that we should be stepping back in order to go forward. How would you explain this statement? Would you explain it by modesty? X.V.W. : I think we should step back from making architecture for architecture’s sake. We should not be making architecture because we’re architects but because the project is done in such a clever and intelligent, thoughtful and fitting way, that we, as architects organize the perfect set of conditions for architecture to emerge. We have to be like movie directors, organizing everything so that the movie can come to play, without actually playing any role. We have to make sure that the contractor – the contractor is actually “making” the physical building – is inspired to do our work. We have to make sure that the client understands that his request/demand is best answer by a specific solution we design for him, which can become architecture. And I think that if we do that then we can become part of something which is not about architecture but which is about working on real issues of the world, large and small, and when we do that I think we have a much more profound basis for architecture, then just approaching architecture as a nice form, or a nice shape. We should not be only working on the outside, we have to work on the mechanics that are IN the project, the logic within the project. If we are able to work on this, then I think we have a much more profound basis for our designs. A.M: I would end up by asking you what was the best piece of advice you received during your career. X.V.W: Wow…[ he hesitates]. I think it has been to take it easy. Especially when I just started working, I was very very impatient about developing my own career. I wanted to be a project architect as quickly as possible. A.M.: Architecture is a profession of maturity. X.V.W: Yes. I’ve graduated in 2004 so after working for 14 years in the profession I start to kind of slow down in the way I do my work (architecture). I’m very focussed on getting things finished in order to be able to work on something new, but things have to evolve. A project takes 5 years or something so you have to learn something in these 5 years, to learn a lesson, only after that to implement the lesson into the next project. A.M: There are always different questions, switch from different questions and we have to develop another answer every time. X.V.W: Yeah, there are multiple projects going on at the same time, so you have links to the projects, and it gets far more interesting, but you have to give a project time to develop itself, and learn while you’re doing. A.M: To enjoy the project eventually. X.V.W: [laughing] If you are busy for 5 years on a project than it would better be fun on the way there. If your only concerned about the problems than these 5 years will be a misery. In project you will be collaborating with a lot of people and you are all working on the same thing. It should be fun, it should be something positive. In 5 years you have achieved something and you had a great time on the way. A.M: So…to stay modest, take our career easily, enjoy and be fun on the way of the process. So it’s perfect since we sum up our interview in a positive way. Thank you very much for your time!